This is everything that I want in an edgy biker romance. Shadow can be a real S.O.B and he owns it. Knowing that he is a volatile, overly aggressive, chauvinistic, domineering, and over all difficult man he still grabs hold of what he wants and keeps it for himself. Even believing that Dani has betrayed the club, Shadow can't turn off his feelings for her and that just pisses him off even more. Dani is his Achilles heel, the only person who ever tempted him to put something before his beloved club and for Shadow that is unacceptable and he sets out to punish not only Dani but himself as well. Hoping that her father will show her more understanding and support than she ever received from her mother Dani has returned to the club. Dani feels that her only hope of surviving is i to convince the club that she had nothing to do with the damage done to the club. That her mother set her up along with the club. Dani knew that it wasn't going to be easy but she wasn't prepared for the rejection and abandonment dished out by the one man that she loved, trusted, and came to depend on. Shadow's love for Dani is scary and beautiful all at the same time. Shadow isn't a man who doesn't know his own strength and power therefore accidentally crushing or punishing the ones he loves. Shadow's power to hurt others is fully recognized by him and his struggle is to keep it leased so that he inflicts the least amount of pain and suffering on those he loves. Shadow loves frighteningly deeply, he simply doesn't know how to love safely. Shadow is so broken and tormented by his own demons that he the ones he loves, his club brothers and Dani, are often thrown on the jagged pieces of it instead of being protected by him. Forge has brought us back to the gritty and disturbing world surrounding the Devil's Dust Motorcycle Club with a bang. The books starts with the fall out from the conclusion of book one and sweeps the reader along a fast paced, crazy, naughty, violent story that doesn't let you go until the very end. Dani's dark side continues to peek through surprising her with how powerful and satisfying acting out makes her feel. Shadow does things for the love of Dani that would be sweet if they weren't so dang disturbing. Shadow is not the kind of man to show his love with flowers, candy, and romantic dates. No, Shadow's proof of love can be found at the business end of a sniper rifle. Forge has managed to make a man so badly damaged almost endearing. I know it sounds crazy but it's true. I've decided not to examine my love of Shadow too closely. I don't really want to know what that may mean for me! 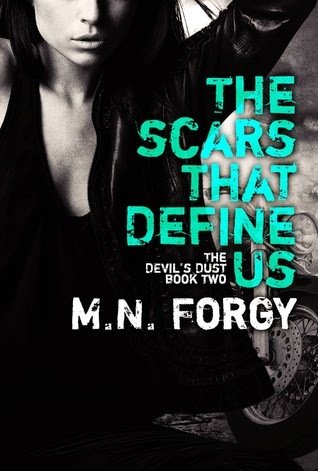 The Scars That Define Us was a wonderful follow up to What Doesn't Destroy Us and is another addition to my favorites list. I am just going to embrace my greedy reader ways and say that I need the next book, The Fear That Divides Us as soon as possible! If you would like to read my review of book 1, What Doesn't Destroy Us you can click here to see it! The Devil's Dust MC has a list of new threats to the club's lifestyle. Dani, to prove her loyalty, is trying to embrace a part of herself that she never knew existed until now. A sinful beast lurking beneath her surface has been awakened and is ready to eliminate anyone that stands in its way. Looking at her stained hands, she rinses the blood from them. She resigns herself to innocence lost and welcomes her thirst for more blood. After a breathtaking turn of events, Shadow is looking at life in a different perspective. Not knowing who he can trust or who he can forgive has left him feeling desolate and alone. As Shadow is laying behind his rifle, he wonders if he can pull the trigger to eliminate the threat. He takes a deep breath and squeezes the trigger, the rifle recoil ignites the fuel that drives him. Retaliations will be required. Boundaries will be shattered. Redemption will be lost. Betrayal so deep, yet they still yearn for one another. Can Shadow overlook Dani’s transgressions? Can Dani overlook the mistrust that Shadow has placed upon her?